by James S. Wilber, Esq., Altman Weil, Inc.
As companies continue to pay careful attention to controlling costs, law departments remain under scrutiny. Accordingly, in-house lawyers regularly look for ways to demonstrate value to their clients. One of the easiest and most cost effective ways of doing this is to seek regular feedback from clients. Some companies require support functions, such as law, to conduct annual satisfaction surveys, often in connection with performance evaluations of law department lawyers and staff. In many companies, however, law departments rarely, if ever, seek formal feedback from their clients about whether they are meeting client needs. Having completed a client satisfaction survey, you can sort your participants all kinds of ways. Let’s give an example by sorting the participants by level and then also identifying them by their office location. Assume that all we do is code them by US office or international office. The plot above shows the total number of participants by the light grey bar for each level. Within the bar there are two colored squares. 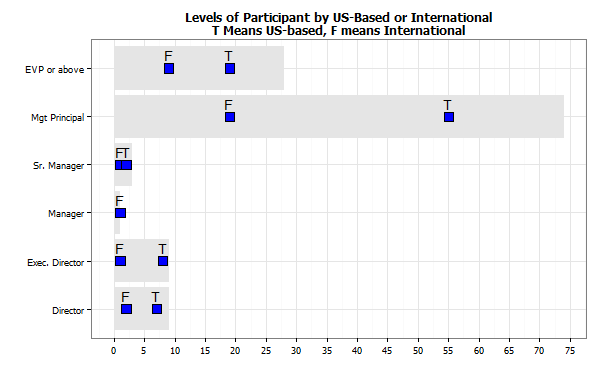 The ones with a “T” on top indicate the number of participants who are US-based when you look straight down to the horizontal axis; those with an “F” indicate the number of foreign-based participants at that level. Most law departments periodically use written or online surveys to gauge the satisfaction of clients with the services they (and outside counsel) provide. A question that often arises is whether (and if so, how) to protect the confidentiality of the responses that come from the executives and other key users of legal services served by the law department? The responses of clients to survey questions, and most especially the narrative comments that they provide, are of immense value to the general counsel and the law department in determining how to improve services and ensure the complete satisfaction of their clients. Although the tabulated results of the survey and the narrative comments are very helpful for these purposes even when the client responses are confidential and the law department cannot tell from whence they came, many general counsel prefer being able to follow up directly with individual clients to discuss their ideas and concerns. That of course isn’t possible if the names of the respondents are confidential. The competing factor is getting clients to be candid, something that is much more likely if the survey is confidential. When you survey your clients to assess how satisfied they are with your law department, you want confidence that you have tapped a representative group by their levels. One way to visualize the responses you get from your survey by a distribution of levels is shown below. For this example, six ranks of clients are stacked from the lowest at the bottom, “Directors,” to the highest-level at the top, the “EVPs or above”. Twenty-eight of the respondents were at the highest level of the company, followed by 74 Mgt Principals. by James S. Wilber, Altman Weil, Inc.
Law departments that appreciate the value of client satisfaction understand the importance of obtaining systematic feedback from their clients. The methodological choice typically is between a written or online survey, on the one hand, or in-person meetings and interviews of clients on the other. The former method is easier, quicker, less expensive (in terms of opportunity cost) and provides a broader base of feedback. The latter method allows for a dynamic, iterative discussion where one answer or statement can lead to other important areas of inquiry, and of course, it can help improve relationships since it is done face-to-face. Our experience points to a hybrid approach being best – a survey of a large cross-section of key users of legal services, followed by in-person interviews of executives and top managers. One advantage of doing an online survey is the ease with which metrics that will help you analyze the results can be generated. There are of course many, many metrics, slices of the data, etc., that can be produced. Set out below is one such example (specifically, a plot done from a metric), which shows a hypothetical company and its divisions and operating units. Contracts are one opportunity for self-service. Here is an update on client self-service, starting from the first metapost (See my post of May 18, 2008: self service with 7 references; Dec. 23, 2009: Carillion plc and its self-service capabilities; Jan. 7, 2010: Catholic Healthcare West and its use of ContractExpress; March 31, 2010: suggestion to boost self-service by clients; April 14, 2011: Cisco tries to have clients take on contracting services; and Oct. 19, 2011: eight reasons to consider contract automation.). I favor chargebacks to clients but this dynamic could lead from both sides to higher budgets submitted by the law firms. If neither the law department counsel who review bills and stand behind budget estimates nor the outside counsel want irate business clients, they will slip toward building in some padding. This sounds like a useful area to explore for law departments that need to educate clients about how best to avoid legal problems. Games could be the spoonful of sugar that helps the medicine go down. Is there something unique about legal departments not possessed by other support functions? “Unlike other departments that have specific deliverables unique to that department, the legal department’s ‘deliverable’ is to advocate on behalf of and address the issues of other departments.” With this puzzling assertion in the ACC Docket, March 2012 at 35, perhaps the author means that IT has sole responsibility to keep everyone’s networks and computers running, HR looks after employees, and Finance alone delivers the company’s numbers. Legal, the authors seem to be saying, responds to the other support functions by enabling their unique activities. I don’t buy that distinction. At least IT and HR would argue that their primary goal is to enable the business to progress (including support functions such as law). If the legal department needs software, IT helps; if the legal department has a nettlesome employee issue, HR helps; if analysis of data about outside counsel spend is needed, Finance helps out. What makes the legal department any different? On the other side, only the law department handles litigation, only it pulls together Board materials, and only it makes SEC filings. Like other support departments, those “deliverables” of the lawyers are unique to it. “We propose that a successful legal department is one in which the quality of the legal services delivered is unparalleled, the feeling of job satisfaction by members of the legal department is high, and the legal department as a whole is regarded as a partner in achieving the corporate goals and thought leader in corporate life.” The high-flying definition comes from the ACC Docket, March 2012 at 26. If that be the measure of success, all law departments are doomed to fail. Consider the three tests that need to be passed. First, “unparalleled legal services,” strictly speaking, means uniquely good, so only one legal department can claim that honor. All the rest fall short of the hyperbolic standard. Second, job satisfaction doesn’t necessarily correlate with high value delivered to the employer. An in-house attorney can be pleased as punch with her perceived contribution but fall woefully short in the eyes of clients.